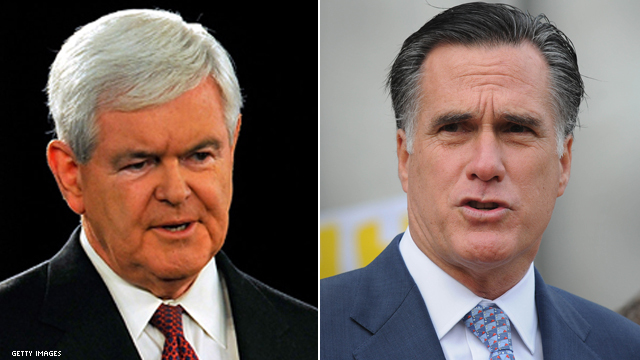 (CNN) - Newt Gingrich responded to criticism from rival Republican presidential candidate Mitt Romney over immigration by detailing his plan and attempting to show inconsistencies in the former Massachusetts governor's record with an abbreviated quote. Gingrich, the former House speaker, sent his Twitter followers two links Wednesday, one to a page of his campaign website detailing his 10-step plan and another to a 2007 interview with Romney. The interview, conducted when Romney was governor, shows the two-time presidential candidate saying the illegal immigrants currently in the United States should "be able to stay, sign up for permanent residency or citizenship." The link to the video was accompanied by a Tweet from Gingrich that read "Here's a trip down memory lane … So what's your position on citizenship for illegals again? (I oppose it.)" However, the clip does not reflect his full point or the end of his sentence. A more complete video provided by the Romney campaign shows the candidate went on to say "but they should not be given a special pathway, a special guarantee that all of them get to stay here for the rest of their lives merely by virtue of having come here illegally." The back and forth on the issue started at Tuesday night's CNN National Security Debate when Gingrich advocated for a "humane" approach to illegal immigration. "If you've come here recently, you have no ties to this country, you ought to go home, period," Gingrich said. "If you've been here 25 years and you got three kids and two grandkids, you've been paying taxes and obeying the law, you belong to a local church, I don't think we're going to separate you from your family, uproot you forcefully and kick you out." Fellow White House hopefuls Rep. Michele Bachmann of Minnesota and Romney jumped on the comments equating them to "amnesty," which Romney said is a "magnet." "Programs that have said that if people who come here illegally are going to get to stay illegally for the rest of their life, that's going to only encourage more people to come here illegally," Romney said. "The right course for our immigration system is to say we welcome people who want to come here legally." Romney also said other magnets, like in-state tuition for illegal aliens and employers who knowingly higher illegal workers, should be stopped. However, Gingrich did not back down amid the charges on or off the stage, instead saying he was "prepared to take the heat for saying let's be humane in enforcing the law without giving them citizenship, but by finding a way to create legality so that they are not separated from their families." Gingrich's plan includes securing the border, updating the visa system and legal guest worker program, as well as creating an earned path to citizenship for the millions currently in the U.S.
- CNN's Steve Brusk and Jim Acosta contributed to this report. We are a nation of law (or are supposed to be). I think that we need to fix our legal immigration issues and secure our borders. Any illegals that are given citizenship should not collect SS, that should go to people who have actually paid into the SS system. Any illegals that commit crimes should be deported, no questions asked. Whether we like it or not, America does need cheap labor. From slavery up to present time, our economy needs the cheap labor. We need to hammer the employers that employ illegals hard. We cannot rise as a country when all some people want to do is drag us to the bottom. I think the American work ethic remains strong but it is degraded by people willing to cheat and bypass the current system in order to make a buck!!! It's funny how Republicans regard every good thing as bad, and everything bad as good. Here, they're attacking each other by accusing their opponents of having done something good for somebody, for not being enough of a jerk. They try to one-up each other by declaring themselves to hate Mexicans even more, vowing to abuse them in every manner possible. What does this say about the debased people they're pandering to? Should people with such twisted morality really be in charge? Wow Doug, shame on the President for calling the people who said 3 years ago that their number one job was not legislating for the good of all Americans but to see that our President failed to bring us out of the crisis that we are in and have since worked 24/7 towards that goal, shame on him for calling them the enemy? They have worked harder than the Taliban to bring this administration, and hence, the country, to it knees so shame on Biden for calling them terrorists? It's said that actions speak louder than words yet you are ignoring the actions of the Republicans to focus on two words, two true words at that. Willard pretty much sums up the intellect (or gross lack thereof) of the typical right-winger. Romney, "flawless integrity"??? And Herb Cain had the audacity (as well as stupidity) to call Democrats "brainwashed"? It's just shameful how insanely ignorant right-wingers are. How do they even remember to breathe? I wish they'd forget. Gingrich and Memory Lane: A nasty bum like Newt would do well to stay off that street, with his history. Legalized all immigrants they worked hard for it, stop blaming illigals for the problems in this country blame the white man for stealing for so many years from the people like the enron co. And so many others. Hey Donkey Party. Mitt Romney's intellect is sky high. To graduate from Harvard with top honors in both business AND law speaks volumes.